Fandom In Stitches: Sponsor That, Baby! 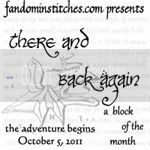 Thanks to the generosity of some awesome fandomy crafters, There and Back Again now has sponsors through March 2012! And guess what?! We've added a GRAND PRIZE. That's right, one lucky person will win a very special Grand Prize for completing all the blocks in There and Back Again. More details to follow. Even with the forthcoming awesome goodness we have to share, we are still looking for a few more monthly sponsors. April, May, June, July, October and November 2012 are still available. Ideally, each prize comes from someone that makes spiffy hand-crafted, fandom-related items and has an online store, business, etc. that we can promote in every post during the month the seller sponsors the BOM. Being a sponsor is easy-peasy! All we need is for you, the sponsor, to share a single prize, something that you feel would appeal to Fandom In Stitches readers. Send us a couple of photos of the prize and a link to your shop/blog, etc. When the winner is chosen, you send the prize directly to them. See? Easy! If you or someone you know might be interested in having their shop promoted here on Fandom In Stitches by simply sharing a prize, please contact us atadmin@fandominstitches.com and we'll get a month arranged just for you!